Ever had the experience that you spotted something cool on a social website such as Instagram and Pinterest and you wanted to get it, but more often than not you could not find a shop to buy it from? As a consumption economy we always want new and fancy things in our lives and online shopping has made this much easier. 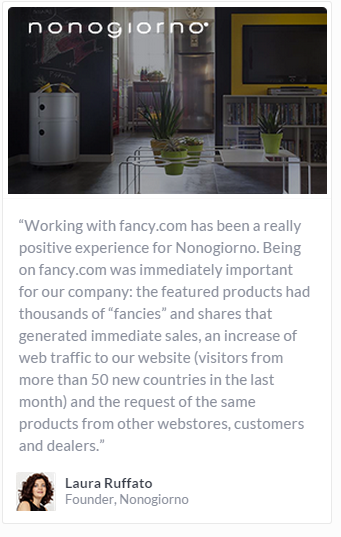 The website Fancy.com solves this problem by allowing the direct connection between seller and buyer in a social environment. 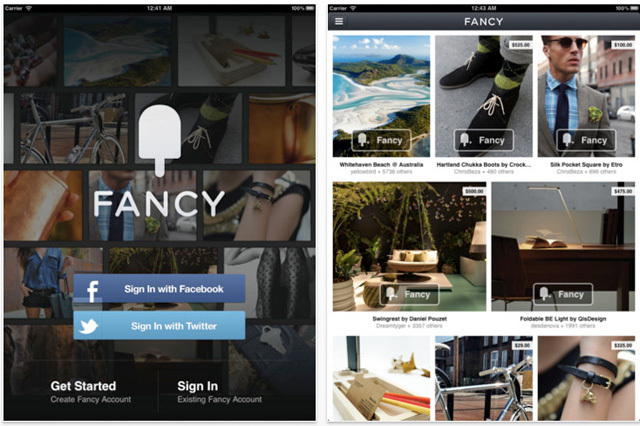 Fancy is the place that allows you to discover and buy amazing things curated by the global community. So how does this business model work? The website can be compared to many different websites, it allows you to buy high-end things on a website as as good looking as Tumblr/ Pinterst and most importantly as money-driven as Amazon. It is based on a new retail model that allows you to shop by accidentally discover new items instead of you deliberately searching for them. In fact it works much the same way as Pinterest, only the website has a direct purchase button at every product displayed. This business model is such an success that even Pinterest is planning to introduce a “buy” button that would let users purchase some items from inside the online scrapbooking service. This would mean direct competition with a website that already controls a 23% of traffic to e-commerce sites (Business insider, 2015). Furthermore, the approach used by Fancy can create problems in the institutional arrangements, the user generated content has a lingering problem with liability. Especially copyright infringement is a constant threat for the Fancy website, the wrong content can result in a law suit against the website itself. However, it can be concluded that this new social buying trend is potentially changing the way we shop, this also means that websites such as Amazon need to compete with a new kind of buying behaviour. After all, for most consumers this trend is a welcoming site, it creates new value in the online shopping experience. Can co-creation help in service recovery? Co-creation is the process of jointly producing a mutually valued outcome. This means that consumers can help shape or personalize the content of their experience, in other words, it can affect satisfaction of a recovery. A recovery is required when equity of a customer-company relationship is damaged. The research investigates the impact on equity for service delays outside the company’s control in the airline industry. The first study demonstrates that using co-creation during severe and less severe delays yields different results. When consumers face a sever delay, co-creation improves the evaluation of the company, whereas less severe delay evaluations are not affected. Furthermore, the study demonstrates that co-creation works as good as compensating customers for severe delays. When faced with less severe delays, co-creation performs just as well or even better than compensating a customer. The second study expands on the first study by expanding the knowledge on repurchase intentions, after co-creation recovery. The study demonstrates that recovery extends beyond the increased evaluations, it increases consumers repurchase intentions as well. This relationship is however mediated by equity, which is the difference between what consumers have received and what they expected to receive. The third study looks at the perception of consumers of the recovery task. When consumers view the recovery strategy negatively, hence if the view it as akin to work, co-creation can harm evaluation. This is especially the case when consumers are asked to co-create during less severe delays. The fourth and final study is the most interesting. The researches explore what happens when a company does not meet or exceeds the customers’ expectations after a recovery or compensation. As expected, companies that do not meet a customer request achieve lower evaluations. However, when a company exceeds customer expectations, the customer does not evaluate the company higher than when meeting customer requirements. Roggeveen, A., Tsiros, M. and Grewal, D. (2011). Understanding the co-creation effect: when does collaborating with customers provide a lift to service recovery?. Journal of the Academy of Marketing Science, 40(6), pp.771-790.